My house. Sigh. I love my house. It's big and loaded with windows. Since there's 7 of us living here, big is extra good. Of course, the fact that the living room and dining room run together adds to it's spacious feeling, and having the kitchen divided from the dining room with just a bar and glass fronted cabinets extends that feeling. I truly love my house. The dimensions are a bit... odd, but that's okay. We've made it work for us. I mean, how many of you have a 44 foot hallway? When we originally started this building, it was going to be a shop (barn) but we were going to live in it temporarily until we built the house of our dreams. Instead we made this work and put a playground for the kids where the house was supposed to be. Maybe someday we'll actually build a house there, but I like things how they are. I like my pole barn house. Sometimes when friends visit for the first time, they're shocked when they step inside. Yes, it's a pole barn house but the space inside and the windows wow them. They see the sky lights and ceiling vaults (which add to the spacious feel), they see the custom cabinets in my kitchen, but they forget Jim was not only a contractor for 25 years, but that his first love is crafting furniture, so the cabinets and old style door trim are just par for the course. They oh and ah and then sometimes they'll start comparing it to what they have. I hate that. See, I've been in their homes. Sure, the house is usually smaller than ours, but their hallway, if they have one, might be 10 feet long. But do you know what I notice? The furniture and how neat and clean and coordinated everything is. My furniture is old. Some of it is ancient. It's also ugly. Very ugly. I mean, orange and gold velour couches went out how many years ago? And those flowers? Gag. And the only thing that might qualify as matching is the origins of each piece: hand-me-downs. But I don't even see the color any more. 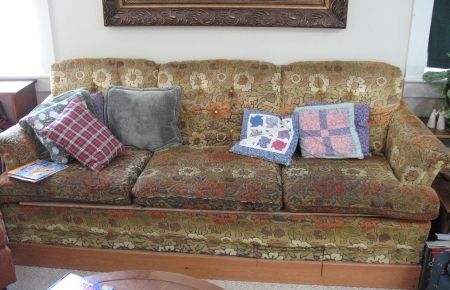 After 10+ years of my family piling on it, the couch is done for. Totally. I think even the plywood we inserted under the cushions is done for. Recently a friend visited and was wowed by the house. I sat there and tried not to stare at the ancient, ugly, worn out couch she was sitting on and tried not to remember the over-stuffed, gorgeous, ultra-comfy couch I sat on at her house. I'm telling you, it was tough. But how many times have we done the same things in our lives? How many times have we thought, “Oh, if only I had ____ like you!” Whether it's a character trait or talent or anything like that. We've all done it! It made me stop and think and be grateful for what I have. No, I don't have a living room people want to photograph for magazines—unless it's for the worst décor and oldest, ugliest furniture. But I do have a spacious house, there's room for all of us. I have a laundry room with a door on it so I can close the door when it's especially bad or when company comes. I have a house that serves its purpose, and serves it well. Can the same be said of me? Am I so caught up in the fact that I'm an orange velour couch in a leather couch world that I miss out on serving the purpose God has for me? Here's the amazing thing- he sees the beauty in us both- in spite of the crummy fabric. Would you believe I just had this conversation with a Christian Sister yesterday? No, not about orange velour couches (smile) but about comparing ourselves to someone else. Yes, you would believe it, cuz that's how God works isn't it? Thanks for a confirmation of His message for me. I totally get this. There are 7 of us in my house too. Our couch is done. (the green envy monster in me surfaces when I go over to my friends houses.) I bought a bolt of fabric and covered my couch so no one sees the GIANT hole in the top. (I have a folded blanket over that hole and used a king size down bedspread cover to cover all of it and then used the fabric to slip cover that.) But that couch sometimes keeps me from seeing the beauty the Lord has in store for me when friends visit. I'm thankful my friends appreciate the hospitality so much more. :) I really appreciated this post of yours cause you are reminding me it's not about the stuff, it's about us sharing the Lord and enjoying the moments he has for us and just allowing Him to shine thru in our hospitality no matter what our stuff looks like. Discontent was my #1 sin for years (and still revives its ugly head when forget to be thankful). I despised the house that my husband made for me and wished for something bigger and better. I'll never have a fancy house, and I don't want one. I love the homey, lived-in-look, simple, comfy house that God gave me. Remind me about this, if you ever hear me complaining or daydreaming about something better. Good reminder! Sometimes I'm in awe at the faith other people exhibit, but I have to remember that we are all gifted differently. The body needs all of the parts, right? So much truth in this - comparison is HARD to avoid. Great post, Peejers. Comparison, I've sure fallen into that trap. A wonderfully written post--thanks for the reminder! Love you!